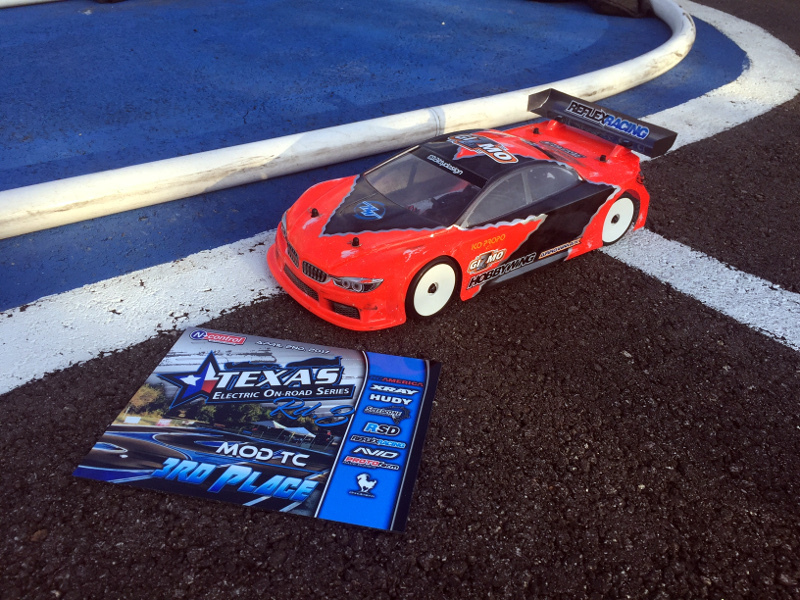 This past Sunday, April 9th, the 3rd round of the Texas Electric On Road series was hosted by N Control RC in Dale TX. N Control RC has a pristine 150×60 ft permanent on-road layout and has been chosen as the host of the 2017 ROAR On-Road Nationals. The race program had a total of 84 entries spread out over 10 heats. 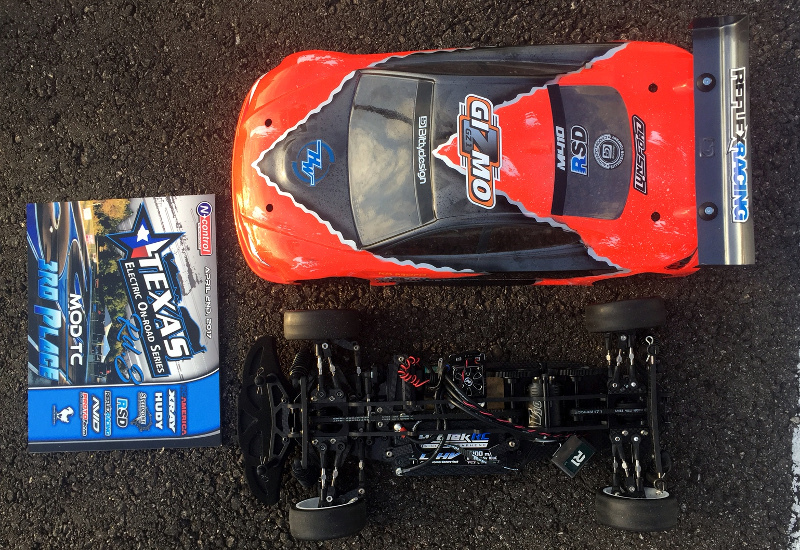 Gizmo USA was represented by Cristian Tabush in Touring Modified and Larry Myers in 25.5 and 17.5 Touring. In 25.5 Larry took the TQ and win going away with his GZ1 while in 17.5 Larry qualified 4th and finished 9th. 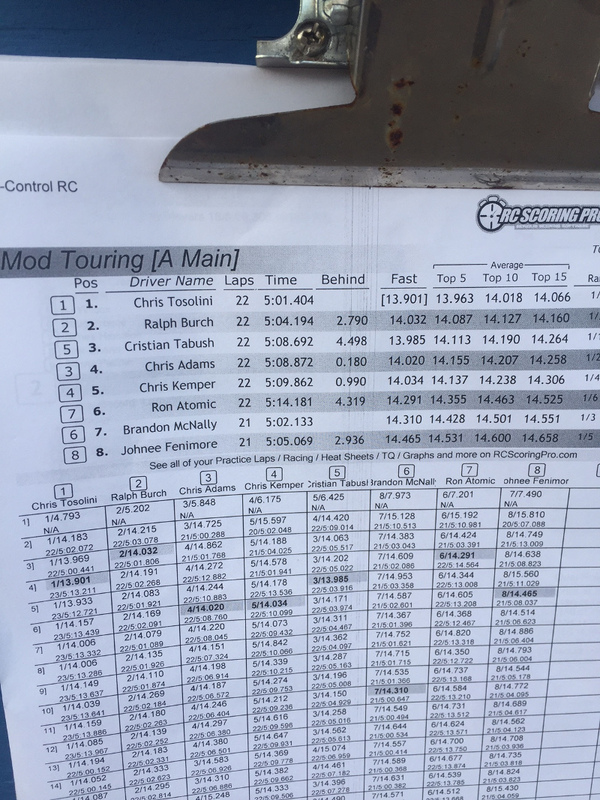 In the modified class, a stack field including former IFMAR world champion Ralph Burch, former IFMAR vice champion Chris Tosolini, and Multiple ROAR National Champion Chris Adams made for some intense modified racing. Cristian Tabush qualified 5th on qual points after the tie breaker went to Awesomatix team driver Chris Kemper thanks to the well earned TQ for round 2 for Kemper. In the main Tosolini and Burch checked out early on and distanced themselves slightly from each other and the chasing pack to finish 1-2. Relating to Gizmo, Cristian quickly made his way up to 4th after a mistake by Kemper on the 3rd corner and with a clear advantage over Chris Adam’s car over the first minute was able to make it by Adams for the 3rd position on lap 3. For the next 11 laps Adams’ car came in and chased down Tabush’s Gizmo and made a good pass stick on the left side sweeper of the track after a small mistake by Tabush forced him to go slightly wide. Adams then led Tabush for 2 laps before a mistake on the same corner by Adams allowed Tabush by once again. The last 2 minutes of the race, Adams, falling behind about second after his small mistake willed himself back to within striking distance of Cristian, and with 2 laps from the end a small mistake by Cristian allowed Chris to tuck up on him for the final 2 laps – leading to a an exciting bumper to bumper dash across the finish line. Ending the weekend on a high note, Cristian was one of only 2 cars able to turn a sub 14 second lap, by laying down a 13.985 in the main. Below we leave you with Cristian’s Hobbywing ESC Settings and Chassis Set up Sheet along with some pictures.